Tim Horton's in England? Yes. Today was my last day of my contract in Birmingham, so to celebrate I brought in a box of doughnuts of the team I had been working with. Always a nice gesture, I think, to thank all those who helped you during your time on your contract. More importantly, though, it was also a celebration of my birth country, Canada. Because I didn’t just bring in any old doughnuts. No, I brought in Tim Horton’s. Tim Horton was a Canadian ice hockey player who played for the Toronto Maple Leafs in 1950s and 1960s. In addition to playing for a series of Stanley Cup winning hockey teams, he also started up a little doughnut shop in 1964 in Hamilton. The chain quickly grew, and today has more than 3000 stores in Canada and over 500 in the United States. Tim Horton's is immensely popular in Canada, with line ups out the door in the morning for a cup of coffee and a cruller. They are also well known for their Timbits, small balls of dough deep fried and coated with sugar, like doughnuts without the hole. Here in the UK, Tim Horton’s made a deal with the SPAR convenience store chain where they sell coffee and doughnuts in small kiosks in the store. I previously ran into one on Haymarket Street in London, but they recently opened a SPAR with a Tim Horton’s kiosk in the Paradise Forum in central Birmingham. The store sells doughnuts, but no Timbits. The coffee is from a self-serve machine, and I am told it is not as good as the fresh brewed stuff back home. Of course, by that I mean they are doughnuts made by a Canadian company… Not doughnuts flown in daily from Canada. 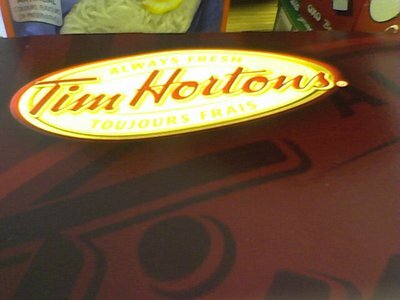 gotta say, Tim's doesn't really make their doughnuts at the stores anymore...and they are not even that good. Also, very uncanadian of me, but I prefer a Starbuck Cafe Misto (really a cafe au lait) to a Tim's. 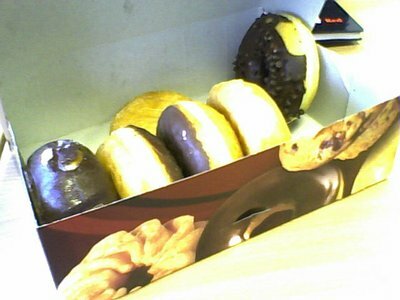 The coworkers liked the doughnuts alright, but I actually found them a little stale. What can you do?